Over the past decade, HarperOne has been known for its unique editions of the NRSV translation. 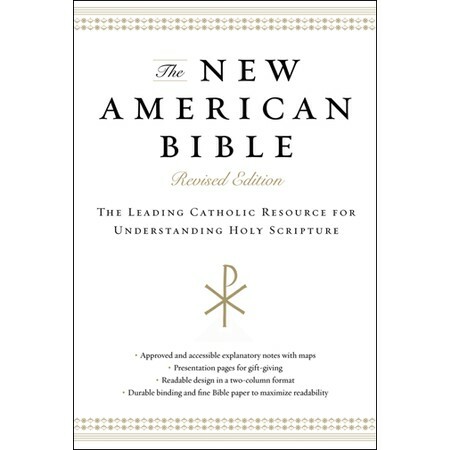 With editions like the Standard, Thinline, Live Youth, and Family Bible, HarperOne has made the NRSV more attractive and accessible to many Catholics. 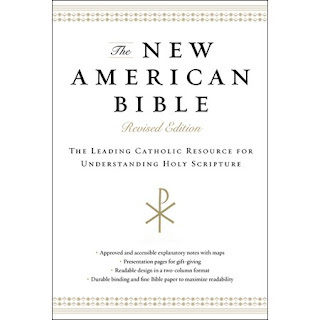 Now, for the first time, HarperOne has been licensed to publish the New American Bible Revised Edition. The HarperOne NABRE currently comes in hardcover, soon to be followed by E-book and imitation leather editions in May. For those looking for an edition of the NABRE that is visually different than many of the previous, cookie-cutter ones, this one might just be the NABRE you are looking for. I am not providing any personal pictures of the hardback edition that I own, since you can view a considerable number of sample pages here. There are many positive elements to the HarperOne NABRE. First, and foremost, is the fact that it comes in a beautiful and attractive layout. The size of the font is pretty standard for a Bible of its size, but the real bonus is the intelligent use of red ink to highlight paragraph headings and for chapter/verse references in the notes. This subtle addition makes reading from this Bible certainly more pleasurable, while also giving the overall layout a more contemporary look and feel. Along with the Little Rock Catholic Study Bible, and its single-column format, the HarperOne NABRE is easily one of the nicest looking NABRE on the market today. The overall look of this Bible is enhanced by the wise ordering of the notes and cross-references. Instead of the standard NAB(RE) look, this edition’s notes and cross-references are organized into three columns at the bottom of each page. While smaller than the sacred text, the notes are not so small as to be difficult to read. Along with the notes, some have complained about the cross-referencing tool found in a number of NAB(RE)’s of the past. In this edition, however, they are easily found in the third column after the notes. The use of asterisks alerts the reader to a note, while a simple letter indicates a cross-reference. Again, very simple and very easy to use. Three additional features make this edition standout. First of all, in the appendix are found 14 full-color Zondervan maps, with map index. While in the past, many of the HarperOne Bibles have either been produced absent of maps or have contained a limited number of drawn or black and white maps, this edition provides large, full-color maps that span the biblical period. The only missing period, which is unfortunate for a Catholic Bible, is the Greek/Maccabean period. Perhaps that was to be expected with maps from Zondervan. At the front of the Bible are 8 Presentation pages, including a photo of Pope Benedict XVI. The presentation pages include sections to record family and Sacramental highlights, including baptism, first communion, confirmation, and matrimony. However, there are no specific sections for children, which is unfortunate. The photo of Pope Benedict is a nice touch. Finally, and quite significantly, this Bible comes in a sewn binding! No need to worry whether or not the binding on this Bible will last. With all these positive features, I need to mention a few of the negative features. The biggest problem with this edition is that the paper is fairly thin, much like the other NRSV editions. This continues to be an issue with most of the HarperOne Bibles. What makes this even more strange is that this Bible is advertised to come “with fine Bible paper to maximize readability” on the dust cover. Yet, the thin paper actually makes reading the text more difficult. It is not huge problem, don’t get me wrong, but a more opaque Bible paper is desirable. The only other minor deficiency with this Bible, besides the absence of one or two maps covering the Maccabean period, is the lack of Sunday Mass readings. That, of course, is a personal preference, but one which I think should be mandatory in all Catholic Bibles. I hope to provide a brief review of the imitation leather edition when it is released later in May. I have been enjoying hours the NABRE LR Deluxe gifted me by a friend in the US last week. Enjoying it with reservations; regarding the translation itself in places ("Hero-God" what the -) and with a cautionary mind regarding the NAB notes (many of which are helpful and in places more expansive those in the NOAB4th) and taking the devotional LR notes for what they are, it really is, overall a remarkable addition to the Catholic bible oeuvre. However, BIG however, what I pine for (drool, weep, gnash) is an RSVCE or even 2CE, *single column! *, reference edition, leatherish would be nice and with notes would be extra-extra nice. The Navarre Expanded NT RSVCE comes close to the dream but it's only the NT, as glorious as it is in every way and a regular read of mine. As the St. Benedict Press RSVCEs are "published by arrangement with HarperOne" one wonders why (other than poor projected sales, ahem) HarperOne, that has a zillion formats on the go these days for NRSV & NABRE, won't give me my dream bible (not made in China would also be nice. I've always liked the NAB. I used to own a very old large family edition. I cannot remember what happened to it though. Probably the casualty of a move. What exactly is the NABRE 'LR DELUXE'? You have me intrigued!